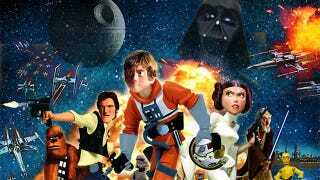 When you own both Pixar and Star Wars, the most logical move would be to let Pixar make a Star Wars movie, no? Well, that's exactly what Disney is planning according to The Latino Review. A Pixar film would be one of many tie-ins that would happen with Episode VII—for example, there are rumors of comics and TV shows. At the moment, there don't seem to be any more specific details about a Pixar film—but should it happen, it's not exactly the most surprising move for Disney to take. The Latino Review has also been right about the stuff its heard about before.